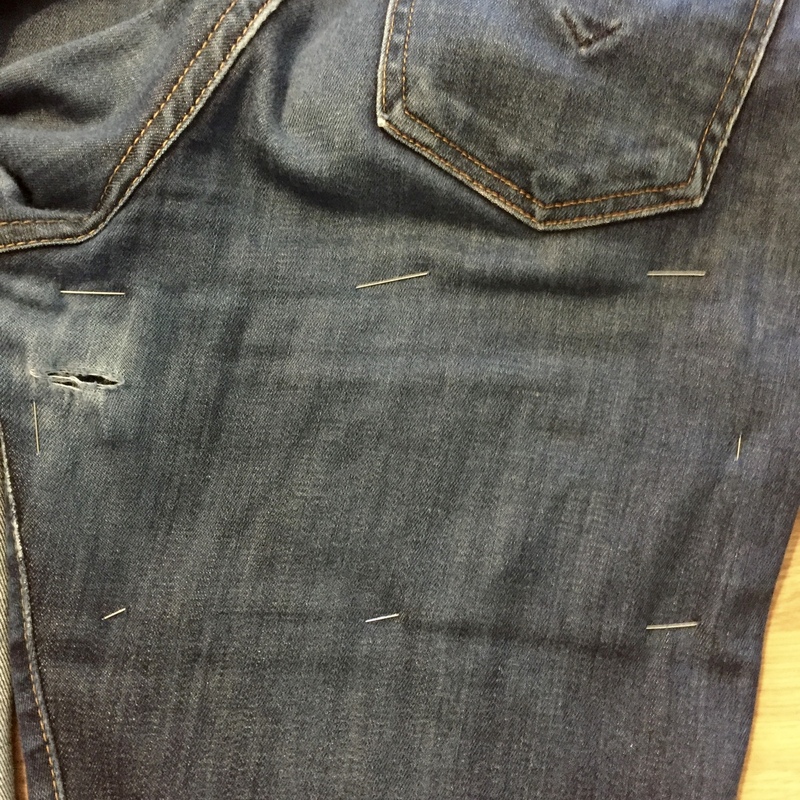 I own two pairs of jeans, they are exactly the same so both are my favourite jeans and both of them grew a hole at the same time in exactly the same place- just on the inner thigh at the back. 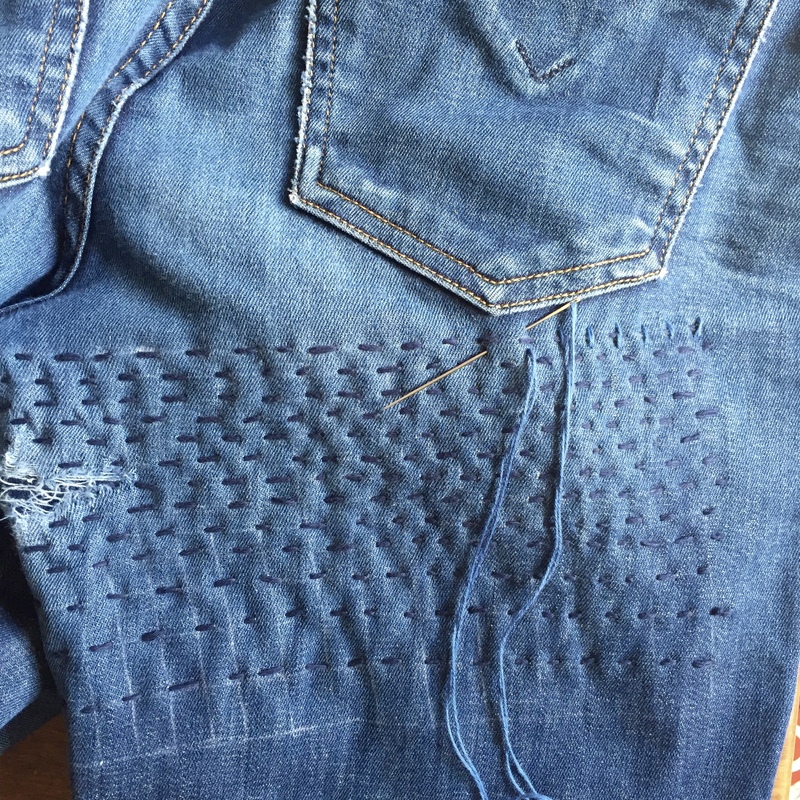 I fixed them both using the same thread in the same colours and stitch pattern…just with slightly different techniques. I used traditional Sashiko thread and needles (which are really sharp, long and strong) bought from Euro Japan Links who specialise in Sashiko supplies. The thread has a tighter twist and is completely matte in comparison to embroidery floss. 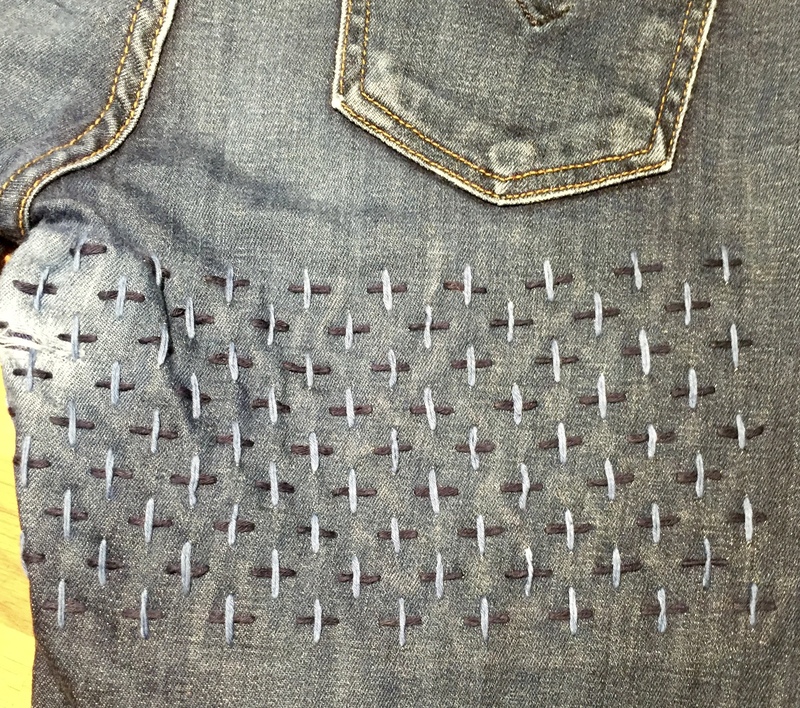 I used stretch denim pieces for the patches on both pairs. 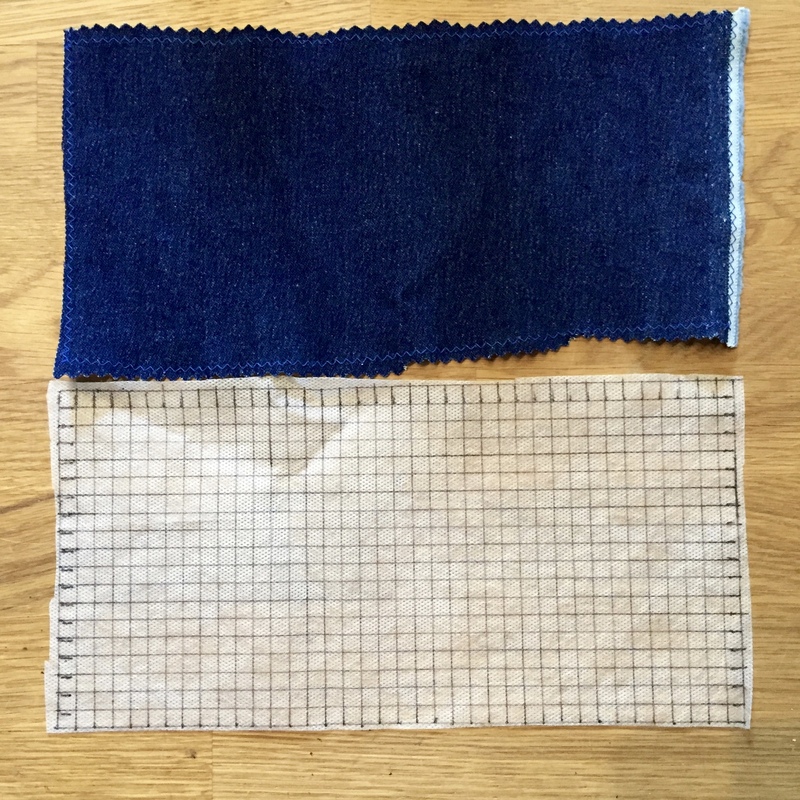 I did debate using something more colourful and cut on the bias so it would stretch when I sat down but jeans are jeans and indigo blue is what I like (and what was in my stash). 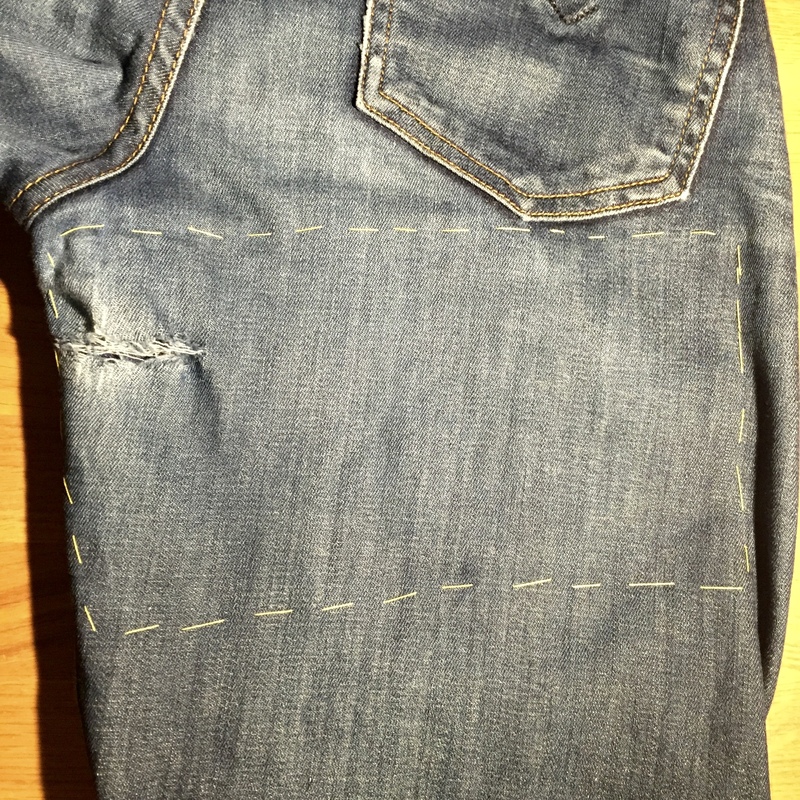 I also decided to patch right across the back leg piece, instead of just covering the hole, so it became more of a feature. 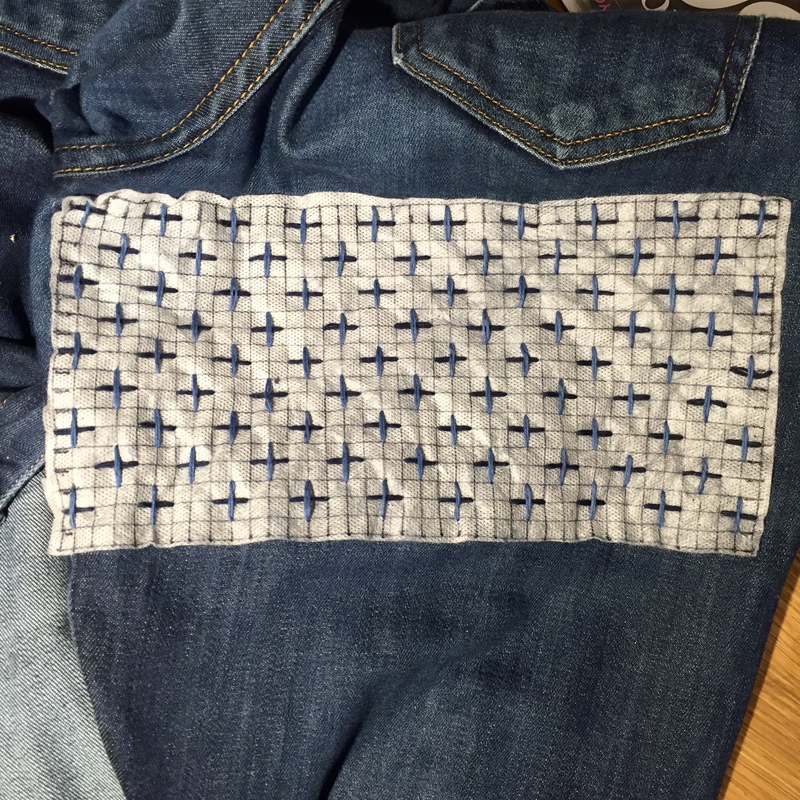 For pair one I basted the denim patch in place on the wrong side. Then drew a grid in white chalk to help space the stitches- I went with Jujizashi which are shaped like crosses. 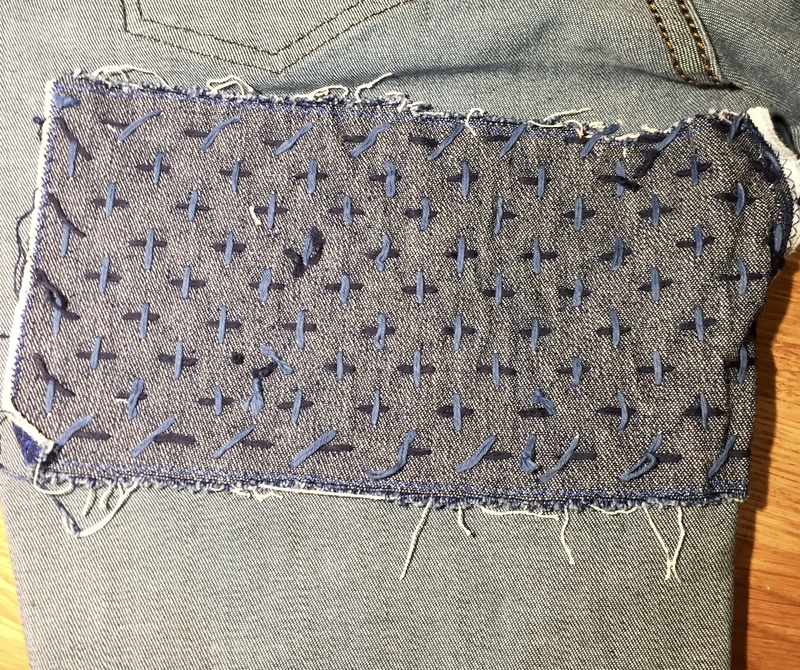 The horizontal bars were all stitched first using the darker navy thread and the vertical bars were stitched second using an air force blue coloured thread. They should be done in straight rows but because my horizontal tows weren’t evenly spaced it didn’t quite work out that way! 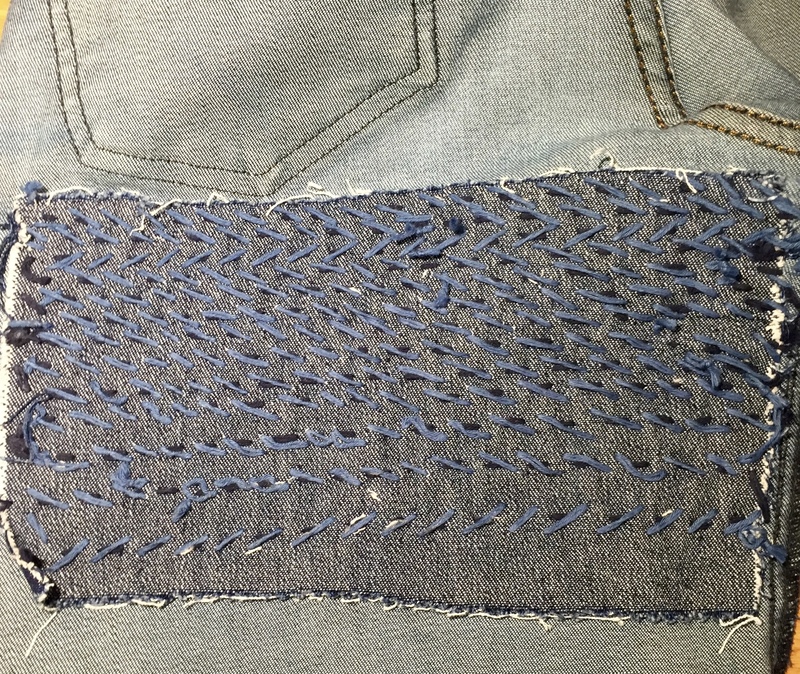 This meant that the back view is messy and the stitches are not in parallel rows- not how it’s supposed to look. I left some slack in the thread at the back (got to be able to sit down and the thread has no real stretch). 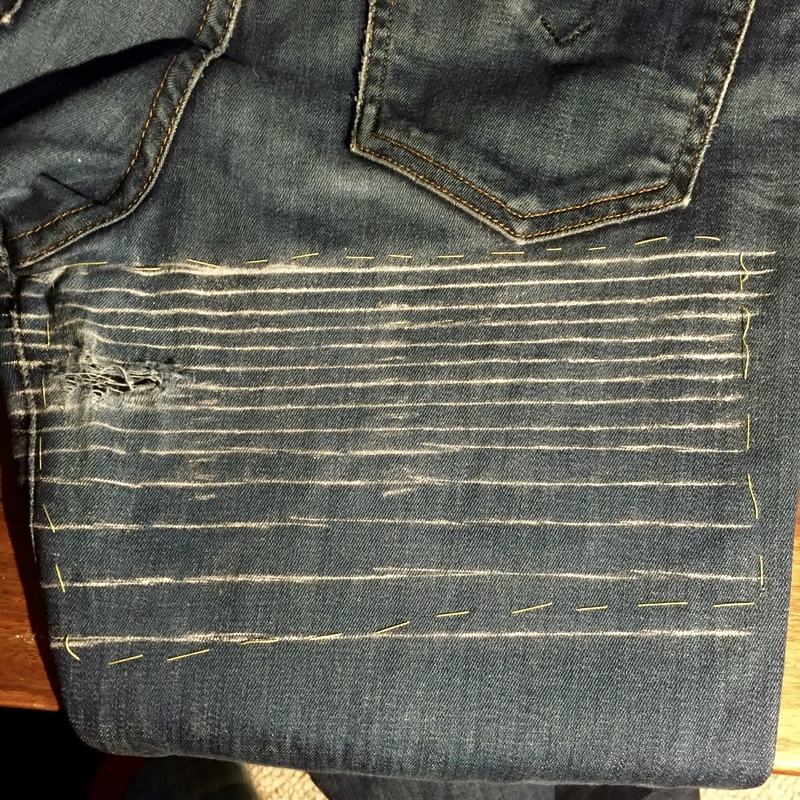 I went a bit off grid with this one so the stitches are not that even but I like the effect and it’s a really effective patch. Although the wrong side leaves something to be desired. For pair number tow I was aiming for more consistent and accurate stitches. 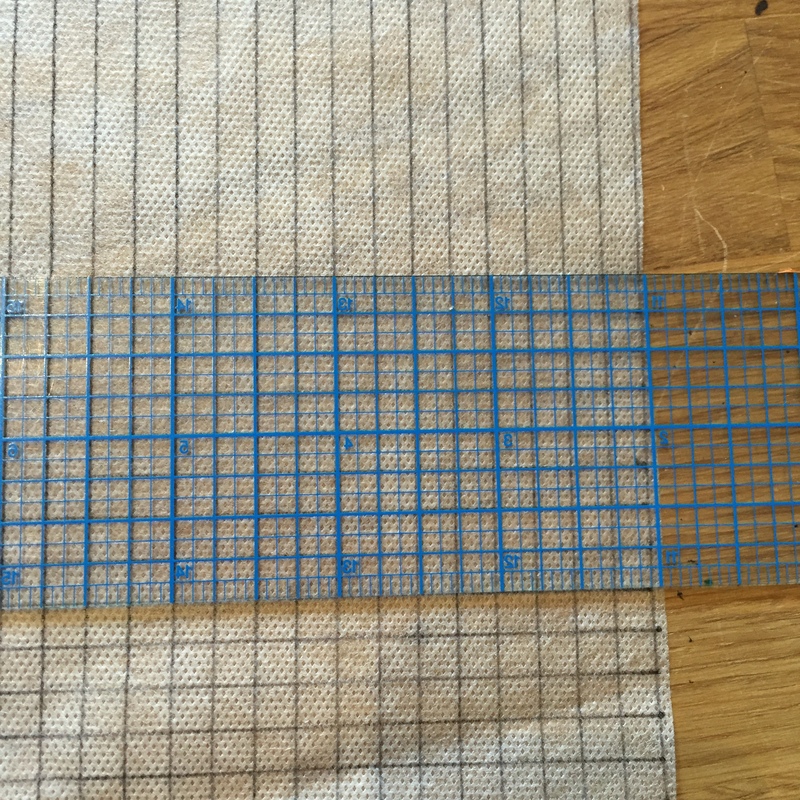 This time I cut a piece of Pellon waster-soluble stabiliser the same size as the patch… and used a quilting ruler to draw a quarter inch grid on it with a fine tip marker. This gave me really clear, fine lines to follow rather than the chalk which wasn’t as clearly defined. 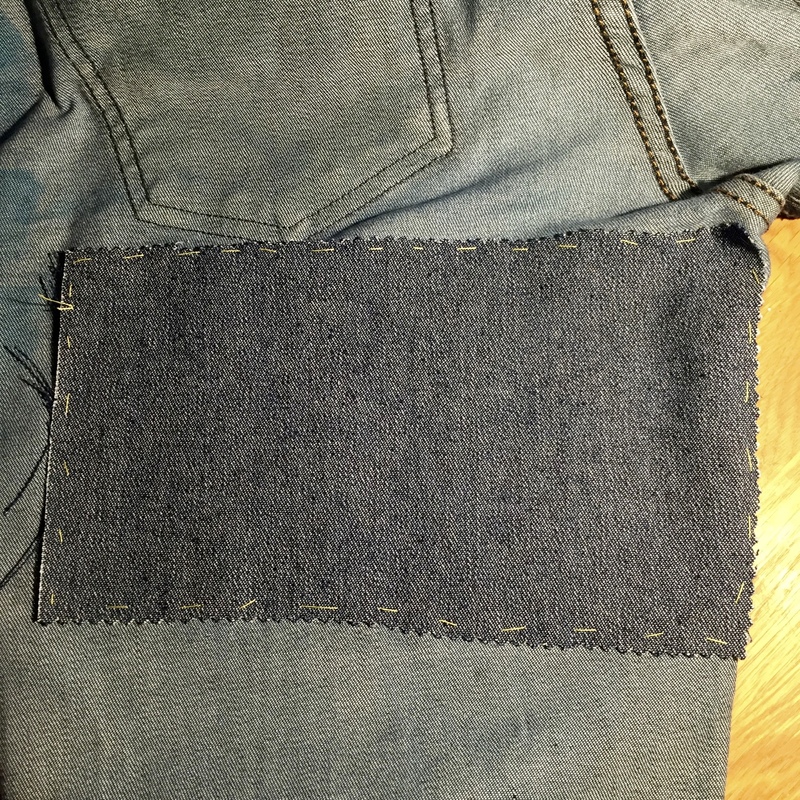 I pinned the denim patch to the wrong side and the Pellon on the right side on top then basted all three layers together. 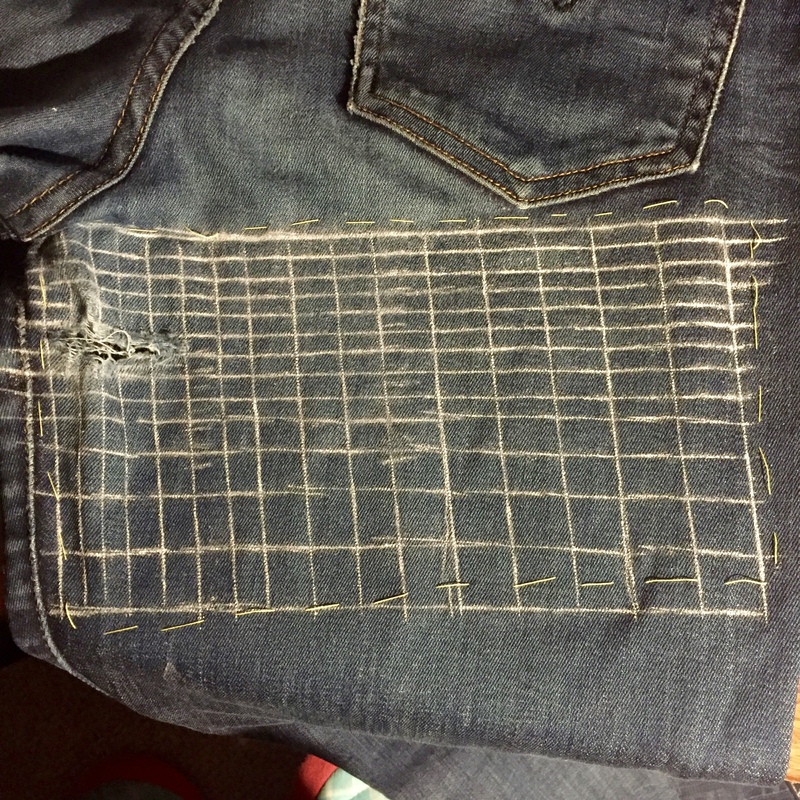 This time I did use the grid to stitch half inch horizontal and vertical rows. 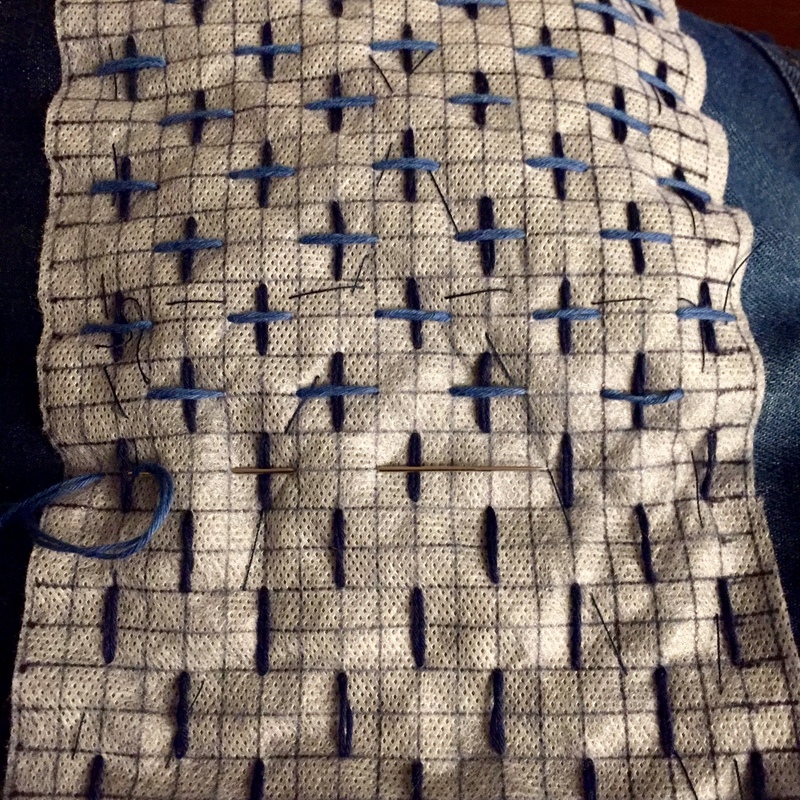 The grid was easy to follow and I had much, much more consistent and accurate stitches. Then it was just a case of throwing them in the wash to get rid of the stabiliser. The wrong side looks pretty good too on this pair. 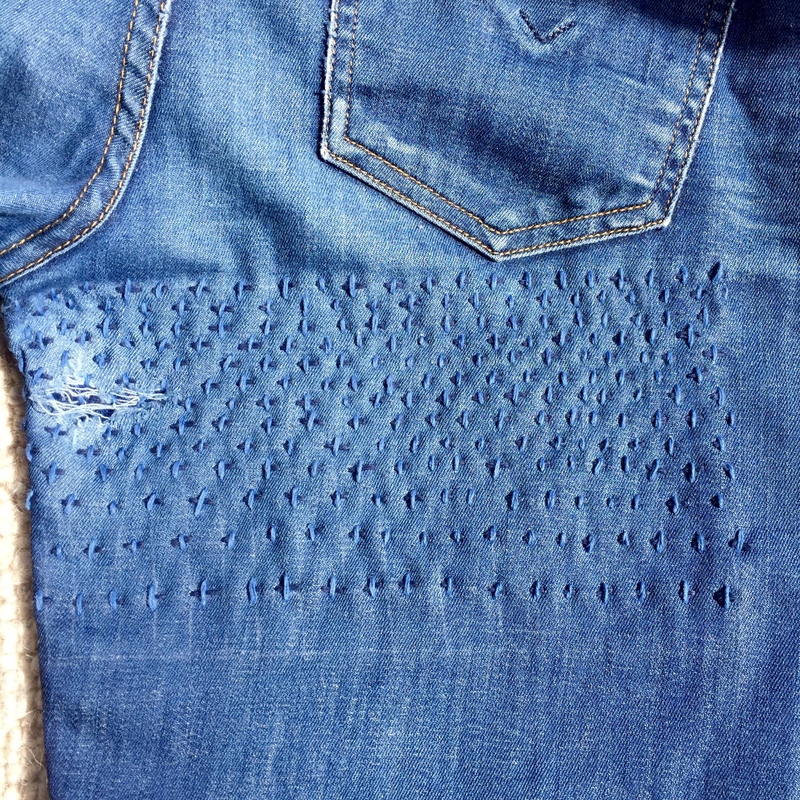 I like the way both pairs turned out and I’ll keep patching- lots of stitches to try and practise needed! 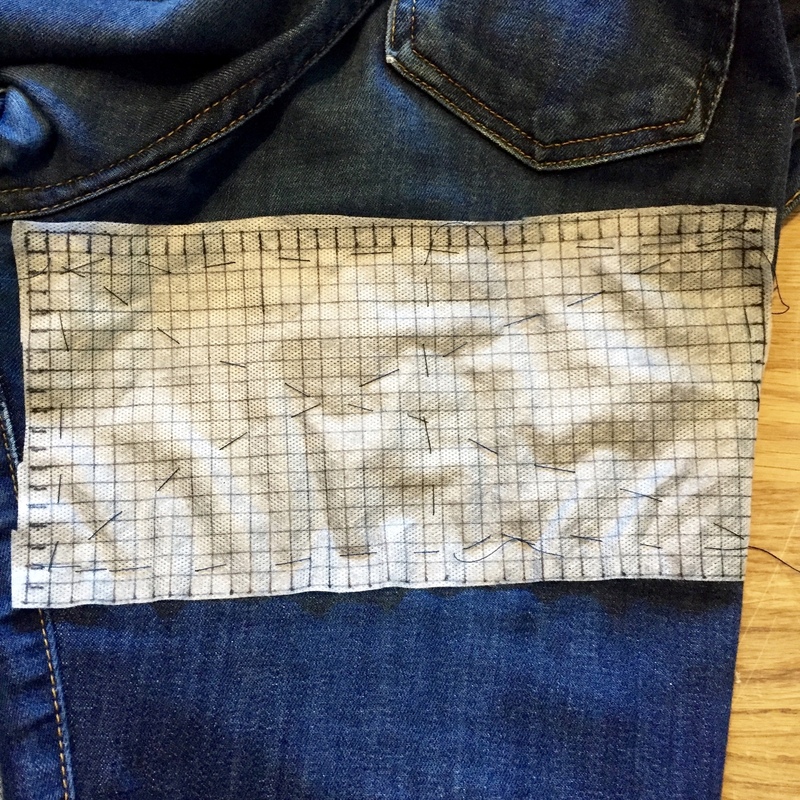 I’ll be using the washable stabiliser (or something similar) to transfer the patterns onto first though I think because I found it much easier to stitch. Thanks for sharing. This is definitely something I want to try.